The cunning and scheming vizier of Agrabah, Jafar looks down on virtually all people of the city, especially princess Jasmine's lover, the street-rat Aladdin. Along with ruling Agrabah by force of the Heartless, he seeks Jasmine's reluctant hand in marriage. His first appearance is alongside Maleficent, who warns him not to steep himself too long darkness, for the Heartless may steal his Heart, though he confidently isists he it out of harm's way. After Jasmine seeks Sora's help in finding Aladdin, Jafar kidnaps her and the two are later seen outside the palace gates. After Jafar disappears and Jasmine is nowhere to be found, the party heads for the Cave of Wonders, and they encounter him in the treasure chamber, where he sets Genie upon them in battle and a confrontation commences in which Jafar is seemingly defeated. Not so, for Jafar rises minutes later to make use of his third and final wish: Turn himself into an all-powerful genie. As Jafar's metamorphosis takes place, he destroys the floor of the treasure chamber, revealing a magma-filled battleground where a seemingly-invincible Jafar relentlessly attacks the party, until the Jafar's new black lamp, carried by Iago, becomes the centre of Sora's attacks. Once the genie is defeated, he is sucked back into his black lamp alongside Iago. 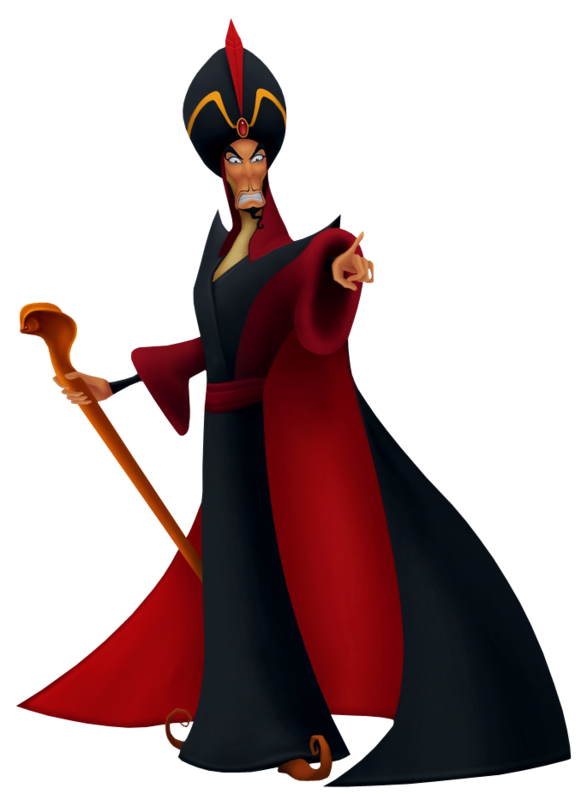 Sly and deceitful, Agrabah's royal vizier was the second-in-command of Maleficent's gathered villains in Kingdom Hearts. Having stolen Genie's lamp off Aladdin, he lures the group into the Cave of Wonders, and while they deal with all manner of enemies and obstacles, uses Genie's power to reveal the world's keyhole and turn himself into a genie. Jafar fights and is defeated by Sora and the others in the magma-filled chamber beneath the keyhole room, him and Iago being sucked into a black genie's lamp. Initially, Jafar spends much of his time in Kingdom Hearts II trapped in the lamp, though preceding Sora's second visit, telepathically tricks the peddler into releasing him. He captures Iago and has him distract Sora's group so that he may attack Agrabah unhindered. The parrot doesn't last long under pressure, however, and reveals Jafar's plan in time for Sora to stop him. After his defeat, Jafar is sucked back into his black lamp, which disappears in a cloud of black smoke when it falls to the ground.